SOF News Update 20190117 – Recent news, analysis, and commentary about special operations, national security, and current conflicts. Casualties in Syria. A suicide bomber exploded a bomb in a busy section of Manbij, Syria killing and wounding scores of people. CJTF-OIR has confirmed that two U.S. servicemembers, one Department of Defense (DoD) civilian, and one contractor supporting DoD were killed. In addition, three servicemembers were injured. The element was conducting a local engagement in Manbij, Syria, on Wednesday, January 16, 2019. It is also reported that a Sikorsky S-92 helicopter conducted a medical evacuation of U.S. troops from the area. U.S. Special Forces have been active in Manbij. In accordance with U.S. DoD policy, the names of the servicemembers are being withheld until 24 hours after notification of next of kin is complete. Nine civilians are reported to have been killed. Five DoD contractors have been killed in Syria and 32 wounded since the intervention of U.S. troops. The Islamic State in Syria has claimed responsibility for the incident. “Explosion Kills Four in Manbij”, CENTCOM, January 16, 2019. JSOC Member Injured During Pistol Training. A special operations service member was shot during training at Fort Bragg. (Army Times, Jan 16, 2019). A subsequent news report says the JSOC member was released from the hospital. (Military.com, Jan 15, 2019). GBs Penalized for “Letter That Went Around the World”. Two Army Green Berets have received GOMORs that are effectively ending their careers. They were associated with an an anonymous email that criticized the lowering of standards in the Special Forces Qualification Course (SFQC). (Breitbart, Jan 15, 2019). MoH and the Battle of Chau Doc. In January 1969, 50 years ago, a Medal of Honor was presented to then- Staff Sergeant Drew Dix for his actions at Chau Phu, Chau Doc Province, Vietnam. A member of 5th Special Forces Group at the time, he was advising Vietnamese Provincial Reconnaissance Units (PRUs). (NCO Journal, Army University Press, January 16, 2019). 7th SFGA Soldier Missing. It appears that a Sergeant with the 7th Special Forces Group is unaccounted for. Crestview, Florida police are searching for the missing man. (Army Times, Jan 16, 2019). 1st SFGA Trains with Japan’s Paratroopers. Members of the 1st Special Forces Group conducted training with members of the Japanese 1st Airborne Brigade in the vicinity of Camp Foster, Okinawa. (Stars and Stripes, Jan 16, 2019). Kenya Hotel Attack and the Pirate-Patch Wearing SOF Guy. The news media had a field day with a photograph of a British SAS member who assisted Kenyan security personnel in responding to a hotel attack by al-Shabaab members. His wearing of a pirate patch sparked intense interest it seems and the media was in a frenzy trying to determine exactly who he was. A description of the attack on the hotel and the response by Kenyan special forces is provided in an article by the Standard Digital. (Jan 17, 2019). A timeline of the attack is provided by The Seattle Times (Jan 16, 2019). It is estimated that 14 people died in the attack. Some news reports say that U.S. Navy SEALs were also assisting Kenyan security forces in the siege. An American who died in the hotel attack was a survivor of the 9/11 terrorist attack. Rifle Scope for SOF. The SIG SAUER TANG06T Riflescope and Mount has been adopted by DoD for special operations forces. (Ammo Land, Jan 16, 2019). Secrets of ‘Five Eyes’. The countries of New Zealand, Australia, Canada, US, and UK each have special operations units. These SOF units train at dangerous tasks and missions and sustain injuries and sometimes deaths. A team of investigators decided to find out just how many injuries and deaths. Read a report by the New Internationalist (Jan 14, 2019) entitled “Looking Through Five Eyes”. Info on Navy SEAL’s Confinement. Representative Duncan Hunter has voiced his dismay about the conditions of confinement for a Navy SEAL accused of the murder of an Iraqi prisoner. The Navy has responded to the accusations. (Task & Purpose, Jan 15, 2019). 7th SFGA GBs Heading to Trial. Two 7th Special Forces Group Soldiers are scheduled for hearings on February 8th. One is charged with the shooting death of his wife; the other is facing charges of sexual battery of a child under 12 years old. (Army Times, Jan 15, 2019). USMC’s Anti-Armor Capability. A U.S. Marine Corps battalion would have a tough time defending terrain while holding off an assault by an enemy mechanized, motorized, or armored regiment. Read how to address this pressing problem in “Bringing Anti-Armor Back: Fixing a Critical Capability Gap in the Marine Corps”, Modern War Institute, January 11, 2019. DIA’s Role. Have you ever wondered about the mission of the Defense Intelligence Agency? Derek Grossman, a senior defense analyst at RAND Corporation, answers your questions. Read “Explaining the DIA’s Critical Role in National Security”, War on the Rocks, January 11, 2019. Remembering SADMs. The Cold War is over but the memory of that long period of rivalry between the west and the Soviet bloc still lives on. A former Army engineer recalls his time serving on a Special Atomic Demolition Munition platoon. (Army Times, Jan 15, 2019). Future Deployments for SFABs. The 1st Security Force Assistance Brigade has returned from its Afghan deployment. The 2nd Security Force Assistance Brigade is getting ready to deploy to Afghanistan. The remaining four SFABs, once established, may be heading to other regions of the world. (Army Times, Jan 16, 2019). CBO Wants to Erode Veterans Benefits. The Congressional Budget Officer published a list of options for reducing the federal deficit. Some of the recommendations include increasing costs of medical care for veterans by raising Tricare fees and other expenses. (Military.com, Jan 14, 2019). Reflective PT Belts and Common Sense. Army Secretary Mark Esper has relaxed the rules for the wear of the reflective physical training belt. (Army Times, Jan 15, 2019). DIA Report on China. The Defense Intelligence Agency has published (Jan 2019) a 140-page report entitled China Military Power: Modernizing a Force to Fight and Win. Access the PDF here on the DIA website. China’s CT Tactics in Xinjiang. Jerome Doyon, a lecturer at the University of Oxford, provides some commentary on the Chinese approach to preventing terrorism in Xinjiang province. Read “Counter-Extremism in Xinjiang: Understanding China’s Community-Focused Counter-Terrorism Tactics”, War on the Rocks, January 14, 2019. Strategy for the Middle East. Gary Anderson, a retired Marine Corps colonel, says that a review of the U.S. political-military strategy in the Middle East is warranted. He believes we have three major strategic options to consider. Read more in “America’s Strategic Options in the Middle East”, Small Wars Journal, January 15, 2019. Sectarianism in the Middle East. A group of writers for the RAND Corporation have collaborated on a 4-page report entitled Countering Sectarianism in the Middle East: Lessons from Lebanon, Bahrain, Syria, and Iraq, January 2019. Explainer of the Syrian Kurds. An article provides a background to the emergence of the Kurds as a force, why Turkey views them as a threat, the Kurds relationship with the Assad regime, and more. Read “Explainer – Where do the Kurds fit into Syria’s war?”, Reuters, January 14, 2019. Exoskeltons for SOF. An article updates us on the recent attempts to outfit special operations forces with exoskeletons. Read “Understanding the Army Case for Exoskeletons”, Exoskeleton Report, January 16, 2019. Upcoming Report on Iraqi SOF. The Department of Defense Office of the Inspector General will be doing up an evaluation of the U.S. and Coalition’s mission to train, advise, and assist the Iraqi Qwat Khasah special operations units. (DoDIG, Jan 14, 2019). Female Marine Sniper. A female Marine officer has graduated from the USMC’s 3-week Scout Sniper Unit Leaders Course. She will most likely become a future recon or sniper platoon commander. The Marine graduated from the Infantry Officer Course in the summer of 2018. The Marine’s also have a 79-day basic Scout Sniper Course for those who enter the 0317 Scout Sniper job field. Read “Female Marine officer graduates from Scout Sniper Unit Leaders Course”, Marine Corps Times, January 13, 2019. Women in Combat Units? Heather MacDonald provides her perspective on how the military is watering down fitness standards because most female recruits can’t meet them. Read “Women Don’t Belong in Combat Units”, Wall Street Journal Opinion, January 13, 2019. 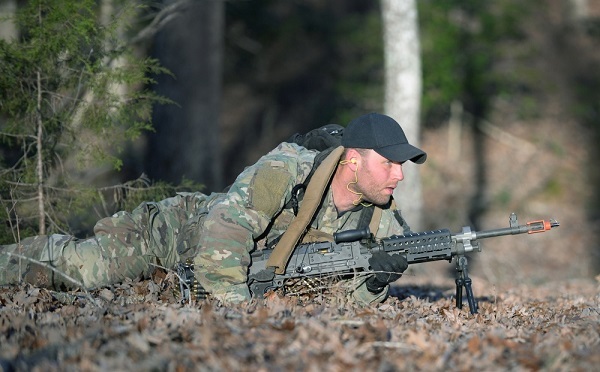 Special Operations Advanced Mountaineer School, U.S. Army, January 15, 2019. The 7-week long course is held in Colorado. Book Review – Principled Spying. Read a book review of Principled Spying: The Ethics of Secret Intelligence, by the authors David Omand and Mark Phythian. Book Review – Armies of Sand. A book by Kenneth Pollack takes a detailed look at Arab armed forces. CTC Sentinel. The January 2019 issue has been published by the Combating Terrorism Center at West Point. (30 pages, PDF). Photo: SFQC Candidate low crawls with M240B machine gun during in Robin Sage. Photo by Ken Kassens, SWCS, Dec 12, 2018. North Korea – Is a People’s Rebellion Likely?